Well, I was encouraged enough with the success of the Chocolate Cupcakes with Marshmallow Frosting, so I decided on another foray into the kitchen. 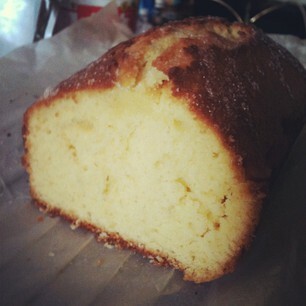 This time, I came across the recipe for a Lemon Pound Cake over at Italian Dessert Recipes. My mother had actually requested for crunchy lemon muffins that I once made, but I wasn't too happy with the flavour and texture of that so I thought I'd try something else. So again, I ended up making a few modifications of my own to the original recipe. 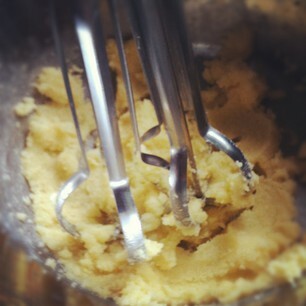 It was back with the old school manual mixer, as my electric one is still M.I.A. I have a sinking feeling it's in storage with the rest of my things in Auckland. 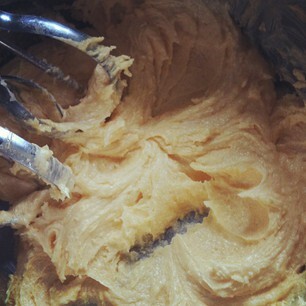 But goodness, creaming butter and sugar with the damned thing started to feel like a mini spinning class! The instructions were to cream the butter and sugar until light and fluffy. After nearly 45 minutes, with hands, wrists and arms aching, I only had the consistency of mashed potato. Whoopie. That'll do it. The original recipe instructs to put in 2 teaspoons each of grated lemon peel and lemon juice, but I put in 3 because I wanted a really strong tangy taste. Et voila! Tangy and still sweet was what I got! I don't know if you can see, but there's sugar sprinkles on top of the cake. I didn't want to follow the lemon sauce provided with the recipe, so I made my own sugar glaze to go on top. It's simply 1/4 cup sugar and 1/4 cup lemon juice, whisked until blended, then poured on top immediately after pulling this little baby from the oven. Once cooled for about 20 minutes (well, we were hungry, and there was no way we were going to wait 20-25 minutes more as suggested), we dug in. The result of the sugar glaze was a crunchy, sweet and tangy top. And the cake itself? 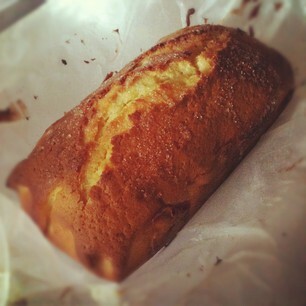 Beautifully golden, slightly crumbly, moist, zesty sweet lemon goodness. It took me about 2 hours to make it (keep in mind the manual mixer) from prep to finish. I think it makes about 6-8 serves. As for my mood, totally uplifted with the cake success. So much so, I finally got on my computer, updated my CV, and applied for a couple of jobs. Fingers crossed!